In a medium saucepan over medium-high heat, heat the oil and sauté the diced salt pork until the pork is light brown, about 5 minutes. Remove the salt pork with a slotted spoon set aside. Add the garlic to the oil and sauté until golden brown, about 3 minutes. Add the onion and cook until translucent, about 5 to 7 minutes. Add the ground beef and cook until browned, about 8 to 10 minutes. Pour in the wine, raise the heat to high, bring to a simmer while stirring. Pour in the cream and bring to a boil for 3 minutes. In a medium bowl, dilute the tomato paste in the beef broth and add to the saucepan. Add the peas to the saucepan, cover and allow to simmer for 15 minutes more. 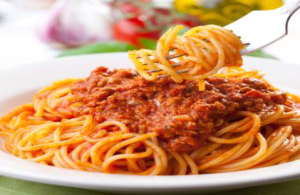 Serve over spaghetti or another long pasta.